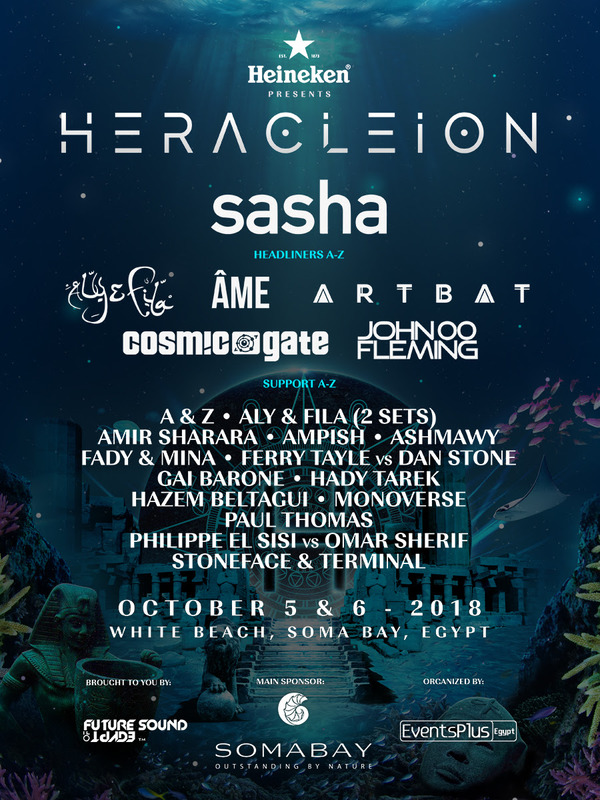 Bringing to you Heracleion Festival in Soma Bay on October 5 & 6, a multi-genre festival bringing people together to dance on the White Beach! The festival will feature some of the biggest names in Trance, Techno, Deep House and Progressive House. With headliners: Sasha, Aly & Fila, Ame, Artbat, Cosmic Gate and John 00 Fleming alongside support acts from all over the world such as Ferry Tayle vs Dan Stone, Gai Barone, Paul Thomas, Monoverse and Stoneface & Terminal. Also featuring amazing talent within the dance music industry from Egypt itself such as A&Z, Amir Sharara, Ampish, Ashmawy, Fady & Mina, Hady Tarek, Hazem Beltagui and Philippe el Sisi vs Omar Sherif. Presented by Heineken with Soma Bay as main sponsors, We invite you to join us for this one in a lifetime experience in the heart of Egypt’s Red Sea! Join us, grab your ticket here or here today!